On Friday JD and I hopped in the car and drove East towards the North Fork to the pies, pumpkins, and wine. Year in and year out, going pumpkin picking is always my favorite thing. I remember each of our trips so fondly, even the time it was really cold and gloomy and we got stuck going in circles in the corn maze. I still have that treasure map tucked away somewhere. This year the patch we usually go to, the perfect, quiet one hidden down a dirt road off the main strip that lets you cut your own pumpkin off the vine, was closed. If I had to guess why, I'd say it was because it was a Friday afternoon. 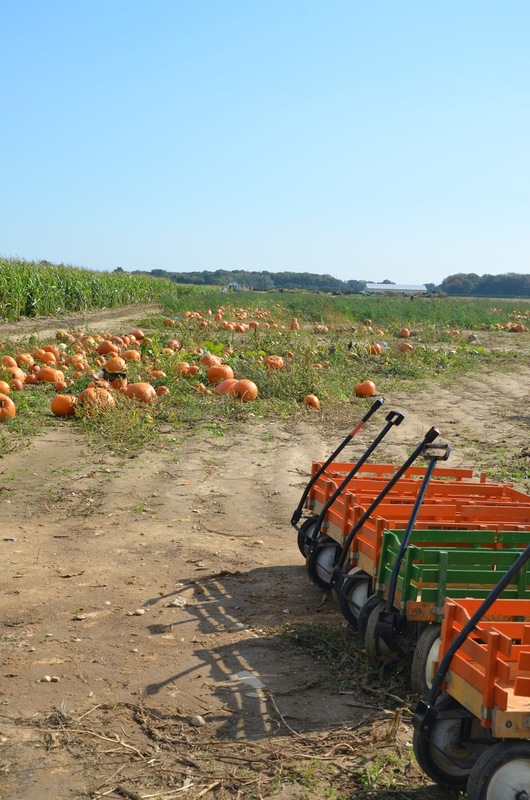 So we continued on down the road to another patch where the pumpkins had already been picked and the best ones were brought towards the front of the lot so you didn't have to walk very far to find one. We skipped the corn maze, picked up a couple of pies from Briermere, and went off to our favorite winery, One Woman, followed by a trip to Greenport for a tasting and a growler of their oyster stout. 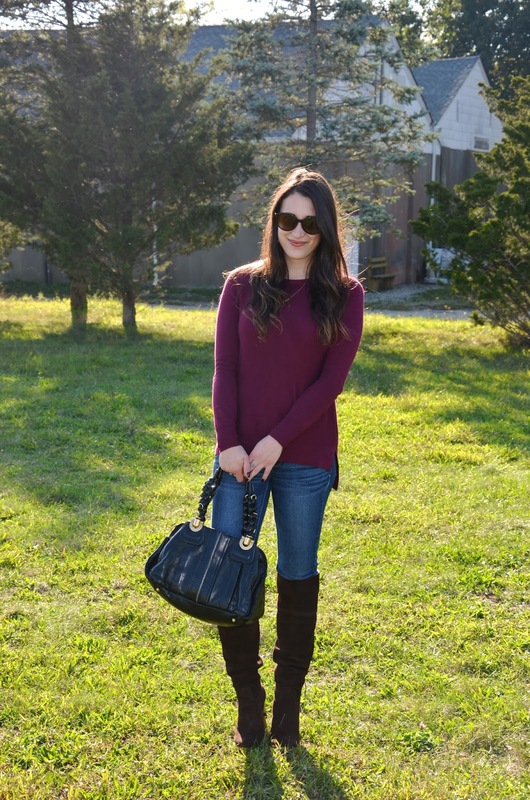 I kept things simple and comfortable in a loose burgundy sweater, jeans, and suede over the knee boots. Obviously, I changed into sneakers for our venture into the pumpkin patch. With all the rain that had come through the day before I wasn't taking any chances. Fun fact, JD and I ended up wearing pretty much the same outfit. Yay! You got to go. So fun- I love a good pumpkin patch and going to a winery after, sounds pretty incredible. Seriously, you go with style- you look beautiful! Those boots are just downright amazing! You seriously have the most amazing shoe collection! And jealous of your pumpkin patch, so fun! Love love love those boots! Pumpkin patch-ing is my favorite and it looks like y'all had a wonderful time! I need my husband to take me! 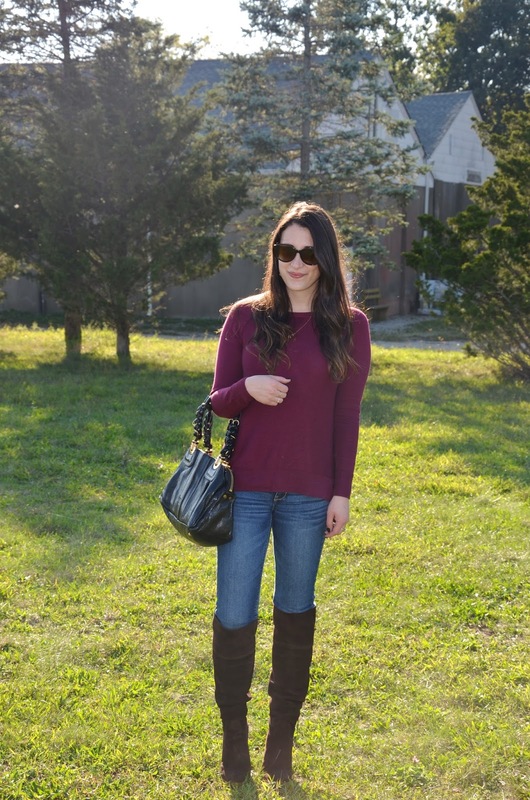 Love your Michael Kors boots! Perfect pumpkin picking outfit. i was about to say "heeled over the knee boots to the pumpkin patch, bold!" this look is so cute and perfect for an autumn afternoon. sounds like a really fun day! Cute post. You look comfy. Question, did you gorgeous boots get messy from all the dust & dirt? Those fields are horrible out there. Love Briermere. I'm going home at the end of this month and mom has already stated she wants to take a drive out there to pick up a few pies. (she freezes them). Hope you had a great time. The weather was amazing this wknd. So thrilled you threw out that fun fact :) And again, I don't know that I can say this enough, I love these boots!! I LOVVVVVE those boots, seriously. Love them! Obsessed with this fall look! You look gorgeous! Love that pumpkin patch. You look great. The boots are so cute! Love the boots! Super cute. So fun!! I haven't gotten a pumpkin, I haven't put up my halloween decorations. I am a major slacker this year. Love that sweater and the boots are fab! Great outfit for a pumpkin patch! 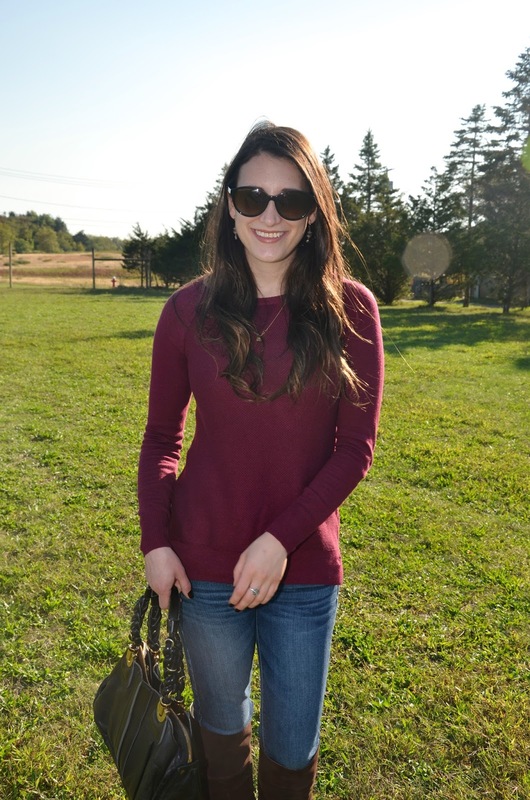 The quintessential fall outfit! I love your over the knee boots! Smart move wearing the sneakers! Don't you just love the North Fork? We actually went to Watermill on Sat to The Milk Pail. Although it's on the South Fork, it's really low key and quaint. I highly recommend it! I've been telliny my husband we need to check out Greenport and now you've convinced me! 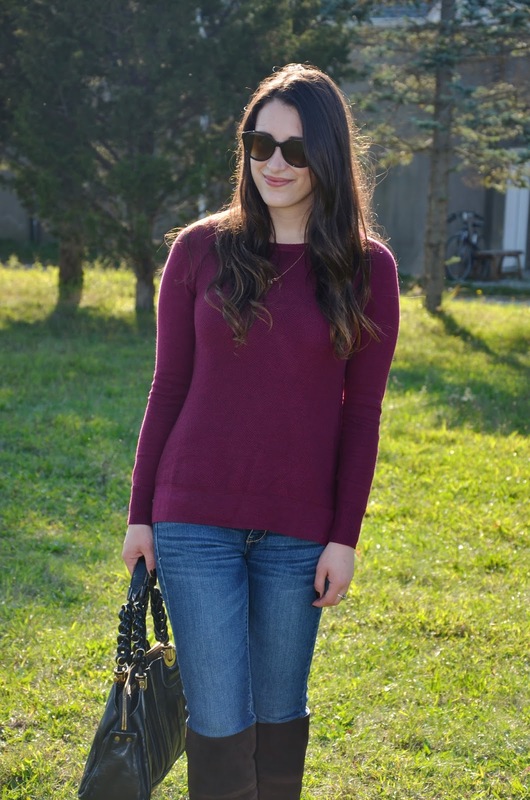 I adore that burgundy sweater! 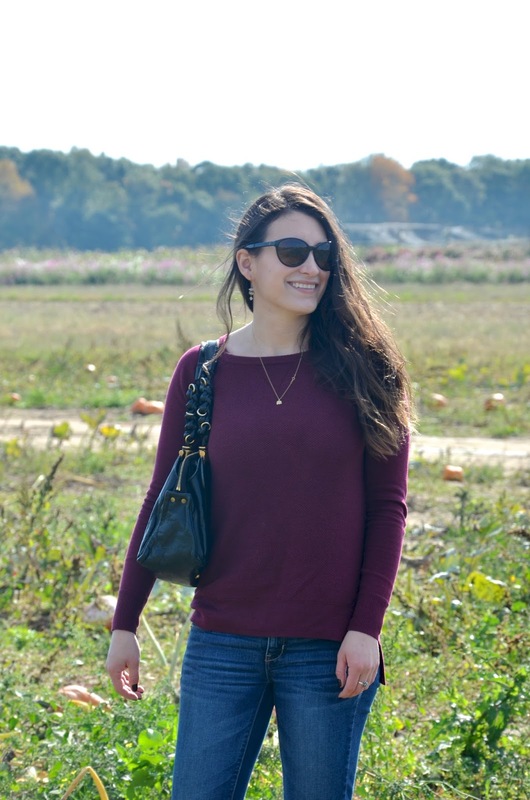 Your outfit is just perfect for pumpkin patch! So casual and stylish! I heart that sweater and pumpkin patches rock! Do not forget to enter the Jeremy Tarian sunglasses giveaway.